Brindes is the Portuguese word for gifts. Apart from just the words the market in Brazil is very unique and has some strong promotional campaigns to go along with its Iconic landmarks and culture.. Here is a picture of the gift shop in the Cathedral of Rio de Janeiro. 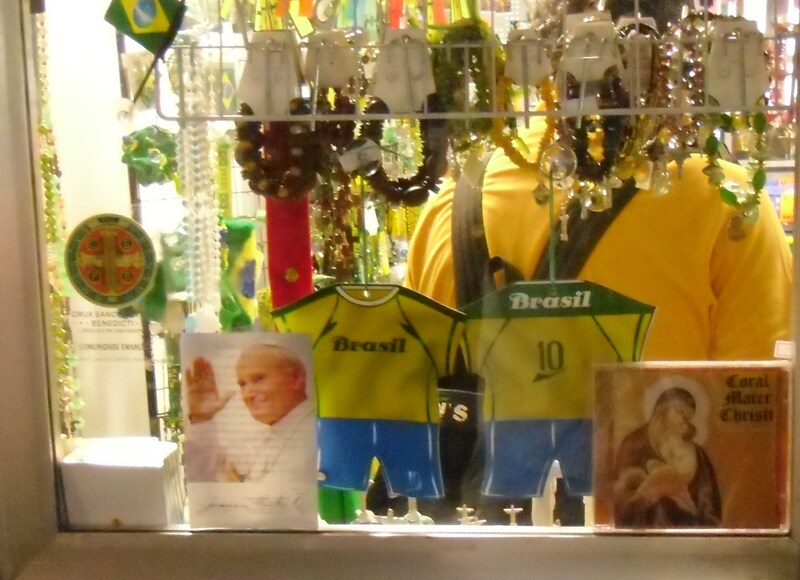 Brazilian World Cup Soccer promotional gifts are nicely mixed in with traditional religious items. You will see the shopper inside also in Brazilian football jersey, standard dress for the majority of the population here right now with the World Cup fever shutting most of the country whenever Brazil plays..
Much of the gifts here revolve around outdoor life, gyms and beaches (and football). Below is a picture of a free outdoor festival on Copacabana beach, the “Fifa Fan Fest”. The use of promotional inflatable hands and noise makers along with bandanas, football jerseys, Headbands, bags and all manner of other Brazil themed items created a very strong atmosphere for the fans. Brahma beer promos & Coke Promos featured strongly at the event. Tents and large inflatables also were in abundance. Click for more on our British Airways Grant.